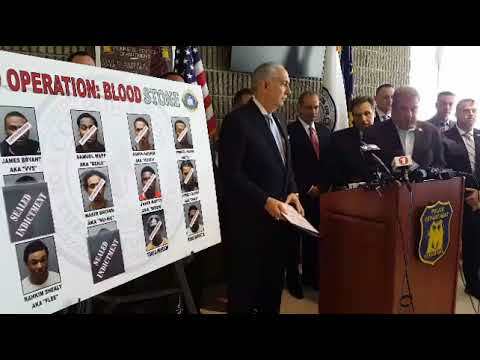 Nearly a dozen members of a prominent Yonkers street gang are facing a series of charges for allegedly conspiring against a rival faction over the city’s drug trade officials announced on Wednesday. Nine members of the Blood Stone gang were apprehended this week, police and county officials announced on Wednesday, with three more on the loose. Following a months-long investigation, the gang members were arrested and indicted on charges that include attempted murder, conspiracy to commit murder and assault, police said. Investigators are seeking the public’s assistance in seeking one particular suspect, Rahkim “Flee” Shealy, who remains elusive and is armed and dangerous, police said. Anyone with information on his whereabouts has been asked to contact the Yonkers Police Department by calling (914) 377-7725.